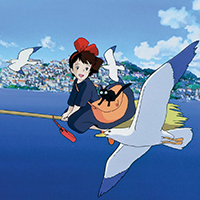 Join The Paley Center for Media, GKIDS, and Anime NYC as we celebrate Studio Ghibli's beloved Kiki's Delivery Service, from legendary Japanese filmmaker Hayao Miyazaki, with two screenings and a fun-filled afternoon of arts, crafts, and contests, with special prizes for all the winners. Stick around to the end of each screening for a chance to win exclusive prizes from GKIDS, distributor of the famed Studio Ghibli film library, and tickets to this November's Anime NYC convention. Screenings are FREE but tickets are available on a first-come, first-served basis. Reservations are recommended starting Friday. Better yet, become a Paley Center Member now for early access to tickets! Free tickets available to Paley Supporting & Patron Members NOW. Paley Individual Members Thursday, June 28 at noon. General Public Friday, June 29 at noon.